BLC_OFFER Offer Represents an Offer in Broadleaf. BLC_OFFER_CODE OfferCode Represents an Offer Code. BLC_OFFER_AUDIT OfferAudit Represents an Offer Audit. BLC_OFFER_CANDIDATE_FG_OFFER CandidateFulfillmentGroupOffer Represents an Offer candidate. BLC_CANDIDATE_ITEM_OFFER CandidateItemOffer Represents an Offer Item candidate. BLC_CANDIDATE_ORDER_OFFER CandidateOrderOffer Represents an Offer Order candidate. BLC_ADDITIONAL_OFFER_INFO - Represents additional information for an Offer. BLC_OFFER_INFO OfferInfo Links to the Offer Info fields. BLC_OFFER_INFO_FIELDS - Represents an Offer Info fields. BLC_OFFER_RULE OfferRule Represents a rule to be applied to an Offer. 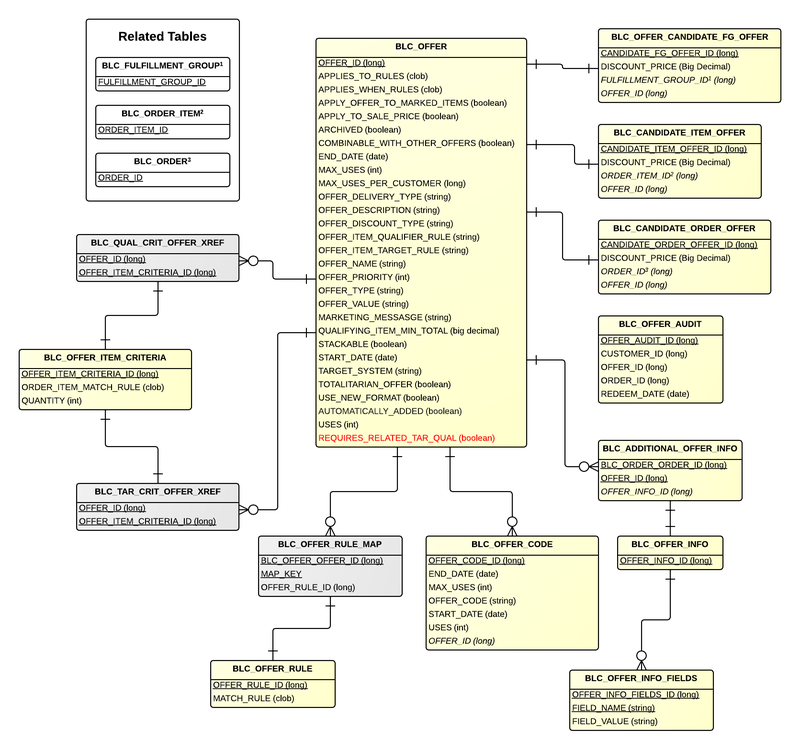 BLC_OFFER_RULE_MAP - Maps an Offer to a Rule. BLC_OFFER_ITEM_CRITERIA OfferItemCriteria Represents an Offer item criteria. BLC_QUAL_CRIT_OFFER_XREF CriteriaOfferXref Cross reference table that points to an Offer item criteria. BLC_TAR_CRIT_OFFER_XREF - Cross reference table that points to an Offer target item criteria. BLC_FULFILLMENT_GROUP FulfillmentGroup Holds fulfillment information about an order. BLC_ORDER_ITEM OrderItem An abstract representation of an item on an order.